Not much of a 'tribute', is it? I'm genuinely curious, are you trying to encourage people to look sympathically towards East Germany? Are you being nostalgic? Or are you being sarcastic? ... The global version should be fun. I have an interest in social history. The DDR has a unique social history. No society like it exists today. It was like a society lost in time. Alot of Germans have genuine nostalgia for the DDR. While the state was oppressive in many ways it also gave a guarantee of employment, cheap housing and subsidised fuel and food. There are many in east berlin who are now worse off. The old communist party has seen a surge in support among older Germans in the east. You forgot the one thing that made it all possible. How ungrateful! Those sort of scenes were the exception rather than the rule. Most East germans were perfectly content to live there. The wall was built to stop highly educated people like doctors and engineers leaving. I'm not apolagising for the brutality of the wall and how the state interfered in people's lives because that was wrong but it would be historically inaccurate to think your picture is a typical scene from the DDR. You really should educate yourself more and not fall for cold war propaganda. Tks for the images .... one of course knows t'was no holiday camp round those parts at the time but it puts it into more context when you visually see all those images "en masse". I've been to Berlin in recent years and highly recommend it as a "city break". Quite an amazing place. 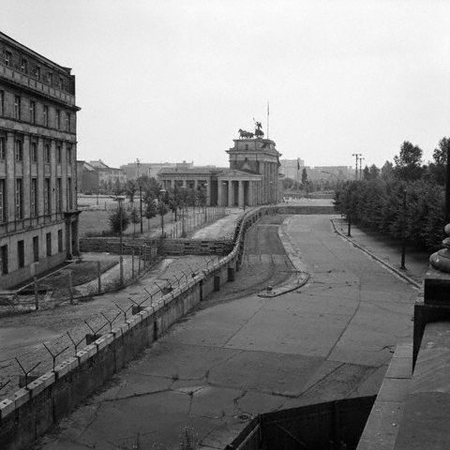 Branderburg Gate and its surrounds show no sign these days as it used to be with the Wall etc. There's very little left of the wall to see at all - they've left small parts standing which one can of course have a look at. Isn't much in the line of buildings preceding recent decades either, with WW2 and I think more of it torn down in decades afterwards putting paid to that. The remains of the Cathedral in the City Centre of which little stands after WW2 Bombing is one to see. I remember having lunch in a Pub right next to Checkpoint Charlie and just inside the former "East Berlin" - all that remains of the Checkpoint is the hut, everything else is gone. Not sure if they "redecorated" the Pub but it had the dull, drab decor that one would see from pics of the old East Berlin/Germany. Beer was damn good tho, as was the Bratwurst, Sauerkraut and Spuds which the locals also seemed to be eating! It's an amazing City and the locals did seem to be pretty chilled and laid back generally, with pace of life not at all hectic - the opposite to what I thought it would be. Thread is 5-10 years out of date, trend of commercializing DDR misery, murder and suffering in process of 'Ostalgie' is already peaked. There is an ongoing fad for nostalgia for the DDR, was in Berlin recently and one shop which sells nothing but merchandise with the pedestrian crossing 'green and red men'. Its one of the few and most attractive legacies of an otherwise very nasty state. I believe there was a certain public loyalty to it and it was a little better at producing consumer goods but let's not forget they shot people who tried to leave and spied on the rest. Remember but learn. There is an ongoing fad for nostalgia for the DDR, was in Berlin recently and one shop which sells nothing but merchandise with the pedestrian crossing 'green and red men'. Its one of the few and most attractive legacies of an otherwise very nasty state. I believe there was a certain public loyalty to it and it was a little better at producing consumer goods buts let's not forget they shot people who tried to leave and spied on the rest. Remember but learn. The "Ampelmännchen" T-Shirts and other such merchandise is a Berlin thing which started out as a fun protest in the 90s. I could post a lot of stuff about Berlin , particularly about the East, since I lived nearly eight years in the place but I suspect the motives of the OP and already went through one such exercise with a different poster some time back. I've already explained my motives. It is purely an interest in social history.